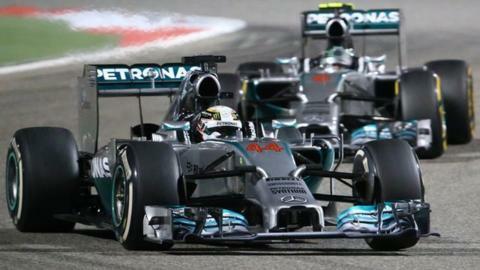 The Bahrain Grand Prix was a brilliant race and Formula 1 was the winner at the end of it. Yes, Mercedes are dominating this early part of the season, and were able to win at a canter should they have chosen to do so. Instead, they let their two drivers go at it wheel-to-wheel. The Bahrain Grand Prix was supposed to be marginal on fuel and I kept thinking: "Any minute now they're going to call the race off and tell them to hold position." There was a very strong and clear message from Mercedes' technical executive director Paddy Lowe to say: "Guys, respect each other, we need to get the cars home." But thankfully they let them race, and what we saw was an incredibly motivated and hungry Lewis Hamilton at his very best. Nico Rosberg tried everything. But even with the benefit of the safety car reducing Hamilton's advantage to nothing at the end of the race, and Rosberg being on the faster tyres, it wasn't enough. Rosberg still leads the championship, but that win for Hamilton in Bahrain, on top of the drubbing he gave Rosberg in Malaysia the week before, will be starting to really hit home with Nico. There is a lot of fight left in the German in this World Championship but we are getting confirmation of why Mercedes head-hunted Hamilton from McLaren. He is in a happy place right now and, when he's on form like this, Hamilton is arguably the best driver in Formula 1. It was an unbelievable achievement by Hamilton to hold on to the lead in the closing laps. He had the disadvantage of not having access to the Drag-Reduction System (DRS) overtaking aid - which Rosberg did - and he was on worse tyres. Rosberg tried and tried. That stop into Turn One - from more than 200mph - is so difficult. You're staring and starting at the braking point. The car potential is getting better each lap as the fuel goes down. And one snag of the brakes and you're gone. It is a huge pressure on the race leader. In many ways it is easier for the guy charging and following. Add all that up and it's why this race really stood out as one of Hamilton's finest. In letting the drivers race, Mercedes look like heroes. And deservedly so. It is a tough decision to let your drivers go at it like that, knowing there is inherent risk. They could have looked like complete zeroes if they had crashed together but you can't have it both ways. You can't have an amazing spectacle for F1 and no risk. I take my hat off to Mercedes for treating us to a race we will talk about for years to come. Not only was there a fantastic race out front, but there were some great battles down the field. Daniel Ricciardo's impressive start to his Red Bull career continues. He showed great self-assurance when he was behind team-mate Sebastian Vettel, and going faster than the German, to get on the radio and say: "Guys, we have to make a decision about what we're doing here." The Red Bull drivers also went wheel-to-wheel with no team orders later in the race and in this instance Ricciardo came out on top. There are the usual caveats - we don't know whether Vettel had a problem - but that is a strong performance from Ricciardo. Force India deserve congratulations for getting on the podium and that will be a big boost for Sergio Perez after a difficult start to the season. His team-mate Nico Hulkenberg had problems with his engine during the race and had to be content with fifth, but nonetheless it was an impressive drive by Perez, who has a point to prove after being dropped by McLaren last season. It's worth bearing in mind that Bahrain was one of Perez's best races last year, too. When he is on form, he can deliver, but he needs to do that at every race, not just one or two. The race came at the best possible time for F1, and the worst possible moment for Bernie Ecclestone and Ferrari president Luca Di Montezemolo, both of whom had been critical of the sport's new regulations. To be fair, those in charge are in a difficult position. The first two races of the season in Australia and Malaysia were not exactly stunners and you can't leave it 50 races before deciding whether something is working or not. I have to admit to being a fan of the loud noise the previous engines produced. But wheel-to-wheel racing will always be a better substitute for loud. You don't want loud and no action. There were many years of silent movies before someone came along and spoiled Charlie Chaplin's reign. Whatever anyone - fans, teams, bosses - have said up to this point is valid. But equally we now have the right to celebrate a great grand prix and say that, arguably, there is nothing wrong with this new formula. David Coulthard was speaking to BBC Sport's Andrew Benson.